Did Afrika's Tech Hubs Really Double In Number Within A Year, Or Are We Just Counting Them Differently? 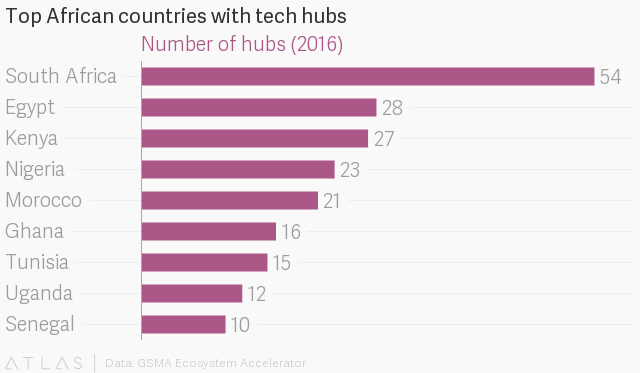 The number of technology hubs across Africa has doubled in less than a year, according to a report by the GSMA's Ecosystem Accelerator. The report attributes this growth to an increase in the number of investors and innovators who are growing local startup ecosystems beyond the continent's most notable tech communities. A total of 314 tech hubs and incubators were identified in Africa, which is more than double the number of hubs identified by the World Bank last year. While this could be a result of different metrics, it could signify an upward trend in startup incubations, which is a positive sign given the rough year that hubs had in 2015. There were several high-profile closures, including Zimbabwe's Hypercube and Impact Hub in Johannesburg. 88mph, another incubator with spaces in Nairobi, Cape Town and Lagos, also announced that it was taking a break from investing in startups. The report attributes the growth in numbers to the combined efforts of entrepreneurs, innovators, telecom operators and giant tech companies, which has driven the growth of tech industries on the continent. With the merging of these different sectors the rise of the tech sector is seeing innovation rise, funding, co-working spaces, skill sets and a vast network to support start-ups. 13% of the hubs in the study are joint ventures between startups and mobile operators. MTN, for instance, [helped launch ActivSpaces in Cameroon](http://techcabal.com/2015/07/21/mtn-cameroon-and-activspaces-will-soon-launch-an-innovation-challenge-for-cameroonian-startups/), a hub that provides both incubation and acceleration programs, and helping start ups secure seed funding. The hubs identified in the report are located in 93 cities in 42 countries, but there is an interesting pattern in their distribution - more than half of these are located in South Africa, Egypt, Kenya, Nigeria and Morocco. Kenya's iHub was identified as an industry leader when it comes to incubation, having overseen the launch of over 170 startups since its inauguration. Crucially, the iHub is adopting a more commercial approach to incubation in order to self-finance its operations, signifying a shift from seeking funding to sourcing funds from within. Tech giants such as Microsoft and IBM have also gotten involved in driving incubation and innovation in the tech industry in Africa, with initiatives such as Microsoft's $75Million 4Afrika Initiative, which aims to drive social development through technological innovation. The drop in bandwidth costs and growth in smartphone usage has contributed greatly to Africa's digital transformation, and we can reasonably say that the best is yet to come.